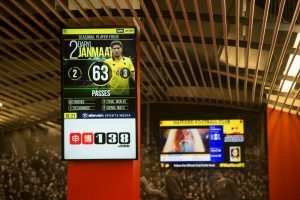 Watford FC has joined the likes of Middlesbrough and Bolton Wanderers in working with Manchester-based Eleven Sports Media on the installation of new digital content channels throughout its Vicarage Road stadium. The Premier League club is the latest to adopt Eleven's Stadium TV, which feature live stats, original content, social media feeds and commercial advertising opportunities for local and regional businesses. Hornets fans will also be able to enjoy live and interactive data performance stats with the installation of StatZone screens. Brands will also feature on Eleven’s Crowd Facing LED technology, a new twist on the traditional pitchside LED advertising. Eleven’s MD, Matt Cairns, said: “We are passionate about the in-venue experience of UK sports fans with each of our products offering a different purpose for supporters. Although Watford becomes the 11th Premier League club on our books, they become the first to house all five of our award-winning products, ensuring Vicarage Road will be amongst the most advanced in-stadium experiences in Europe. Spencer Field, commercial director of Watford FC, added: “Quite apart from the fact that Eleven’s in-stadia content offering will provide compelling match insight to our fans, a major reason for working with them is the resultant expansion of our partner programme. Eleven currently has digital content partnerships in place with more than 60 sports organisations.